Oh wow! 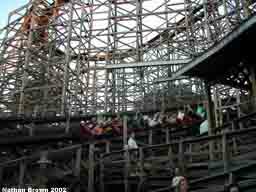 I had been on a woodie hiatus for a while before riding this one and Phoenix. What an amazing coaster. I had forgotten how much of a blast wood is! Excellent coaster. Air, gs on turns, tunnel, helix. Based on John Allens design for Elitch Gardens, it had to be his best work. Twister is great! It gives a pretty wild and intense ride. 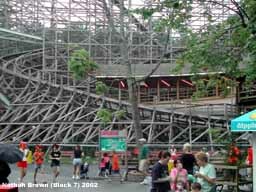 Not a lot of airtime, but still a fantastic woodie! A good twister. It twist back on itself which is pretty fun. 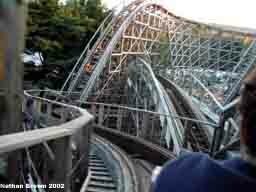 An awesome wooden roller coaster. Beaten only by the Phoenix. The twists and turns are so much fun. Its fun to try to keep your hands up for the entire ride. Also when you go around the last turn just before the tunnel, your picture is being taken. I have a good collection of pictures with my cousins where we strike different poses just before the tunnel. Its really fun. i love this ride! higher than phoenix with plenty of airtime. it has many drops and twists which provids an excellent layout. 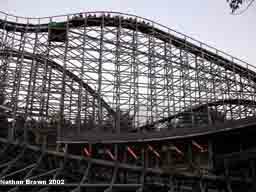 A very unique wooden coaster. Great trains, great maintaince, but unfortunatly the ending is abit of a dud. 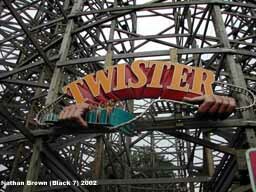 Great coaster, best tunnel around on a coaster.